Two Indian movies will compete with 13 films from other countries for the Golden Peacock award at the International Film Festival of India. Marathi film 'Ek Hazarachi Note' (1000 Rupee Note) and Bengali movie 'Chotoder Chobi' are among the films selected by an international jury for the competition section of IFFI, which will begin here tomorrow. The jury, headed by 69-year-old Polish filmmaker Slawomir Idziak, will judge the best film for the coveted Golden Peacock award, the organisers said. 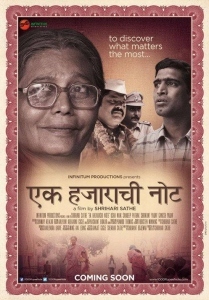 'Ek Hazarachi Note', directed by Shrihari Sathe, is about a poor aged widow who lives at a small village in Maharashtra's Vidarbha region. Her only son, a young farmer, has committed suicide. The tale takes a turn when she gets a Rs 1,000 note from a politician at an election rally. Bengali movie 'Chotoder Chobi', directed by Kaushik Ganguly, is about a circus artist who starts selling cheap insecticide in local trains to make a living. These films will compete with the movies from Cuba, Canada, Turkey, China, Iran, Israel, Russia, Hungary, Uruguay, USA, Vietnam and Kazakhstan, according to the organisers. The IFFI would be inaugurated by megastar Amitabh Bachchan here tomorrow. Union Information and Broadcasting Minister Arun Jaitley and other dignitaries would be present during the ceremony. Will mining get revenue of Rs 500 crore at least the next financial year? 21 Cr to each municipality, 80 L to each panchayat!! Modi plans to shift Defence to Jaitley, where will Parrikar go?